When I rule the world and according to my schedule that will be soon, Gold Lamme sashes will not be a choice, they will be mandatory! You'll all be happier, trust me, I know what I'm doing. 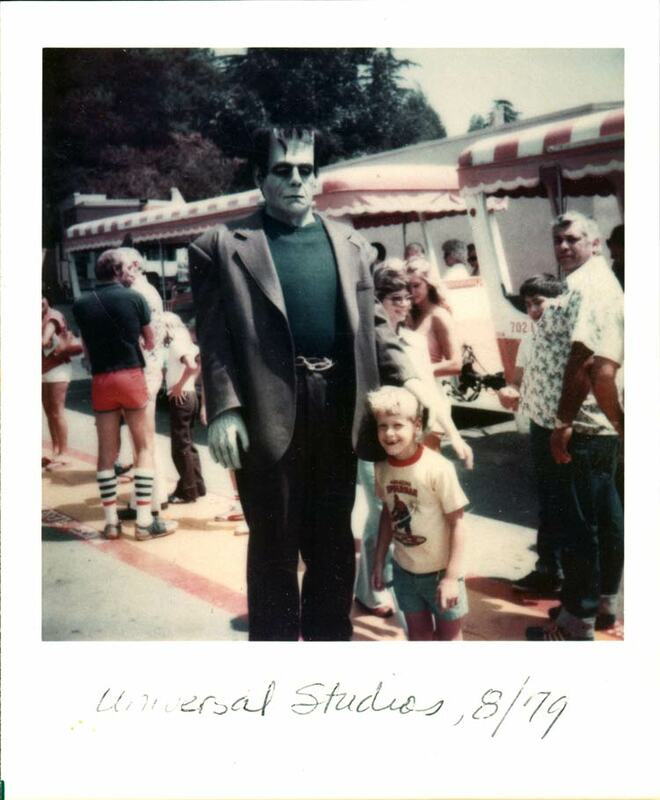 Adam submitted ANOTHER great shot of him at Universal Studios circa 1979. Thank you Adam! I don't get enough Universal Monsters appearances here and being a huge Frankenstein fan this one brings me joy. 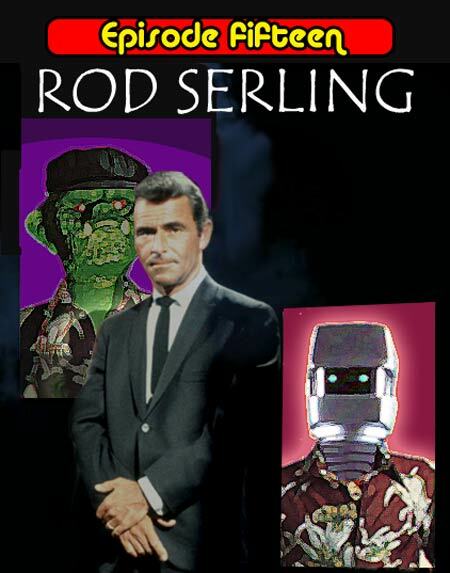 This month's show is a celebration of Television icon Rod Serling and is exploration of his career and legacy. Even though he passed away in the mid 1970s, he had an impact on pop culture that is still strongly felt today. Episode 15 talks about his life, the Twilight Zone and his career after that including Planet of the Apes, the Zero Hour, Night Gallery, Phantom of the Paradise and something called Fantasy Park. This website has a demo reel for Fantasy park, the simulated rock concert series hosted by Serling. The Gold Key Twilight Zone comics Brian discussed ran for 17 years! Rod Serling's intro to Phantom of the Paradise is haunting and effective. Jason's company Bif Bang Pow! has created an amazing array of Twilight Zone merchandise. Serling's contribution to the Planet of the Apes script is possibly one of the most memorable scenes in SF cinema. Paul Williams is doing quite well these days. 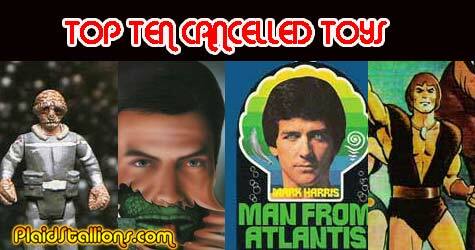 When syndicated, episodes of Night Gallery were mingled with this unrelated series starring Gary Collins to increase the offering to 100 episodes. The only thing on the menu today is sexiness. 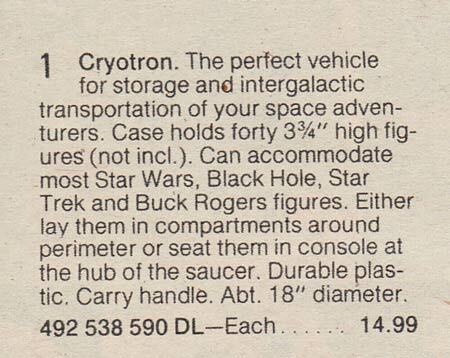 Cryotron is a spacey action figure case offered by Sears Canada in their epic 1980 catalog. I'm not sure who made it and I never had one but I remember it mostly because I stared at the page it was on for a LONG time as a kid. 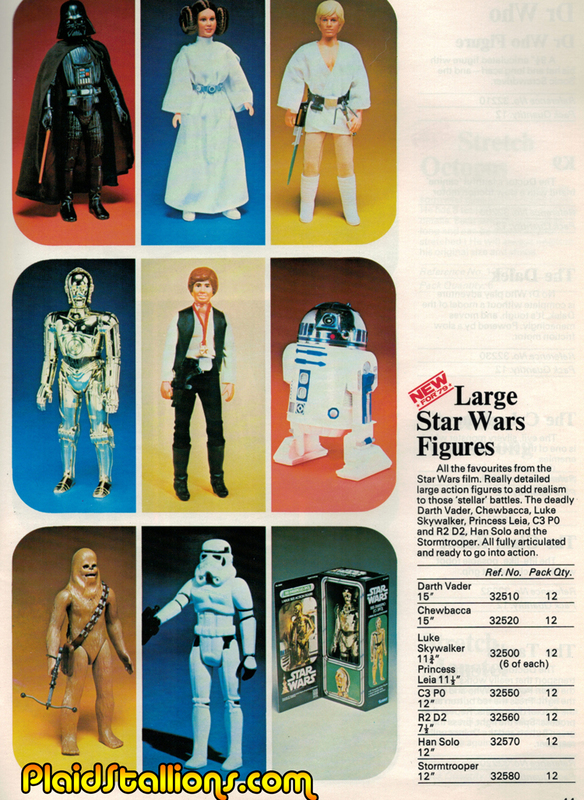 It's one of those oddball items snuck onto catalog pages that is meant to catch the heat of Star Wars without ever passing Lucas's desk, I love stuff like it. I was surprised to find out it's fairly hard to get but doesn't command a terribly high price either, funny how that works sometimes. After literally 30 years of toy shows, I saw my first one this past December with a child's name scrawled across it in magic marker. I'm surprised I didn't go home with it. Given my unhealthy obsession for all things Tarzan combined with my love of Rack Toys, it should be of no surprise to anyone that I flipped out when I saw this. It's so great I'll forgive the fact that Tarzan is clearly a giant! Welcome to your double date from hell, they met at an improv class BTW. 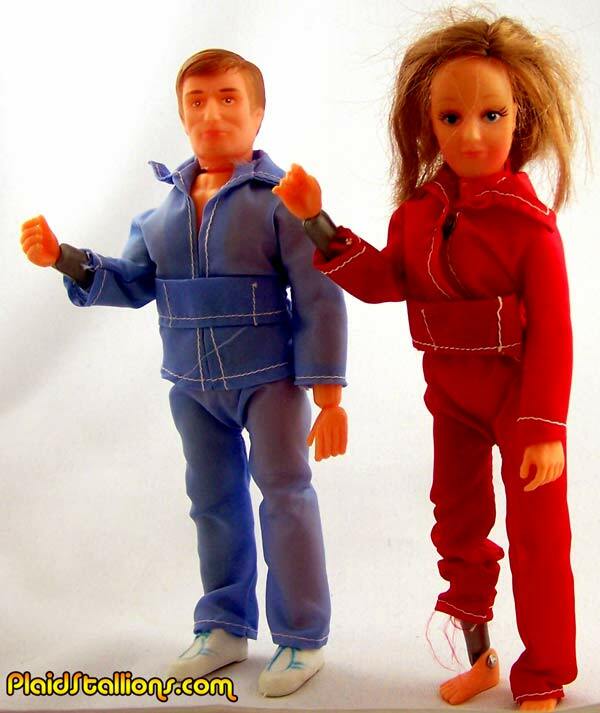 The Kenner Six Million Dollar Man toy line is one of the most memorable and successful toy lines of the 1970s. With the bright light of big sales, you attract a few bugs. A lot of competitors come and try to "cut your grass" as a former boss of mine would say, as the list goes on we'll see it gets more and more blatant. 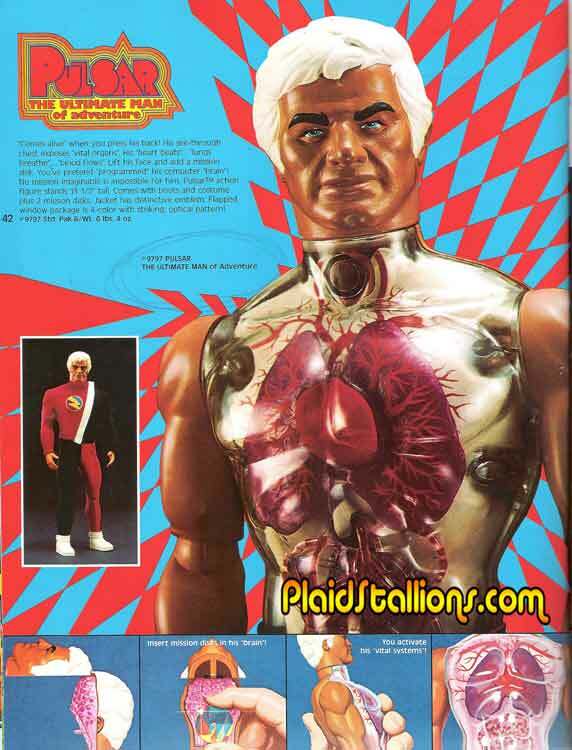 When faced with the overwhelming popularity of Steve Austin, Mattel decided not to play in the Cyborg sandbox at all but went sideways and made an all organic superhero. That's pretty clever, combating steak with a vegan alternative, as a bonus, Pulsar was super gross to look at which is a bonus for young boys. Mattel sold the character for two years and didn't pay anybody a dime in licensing. 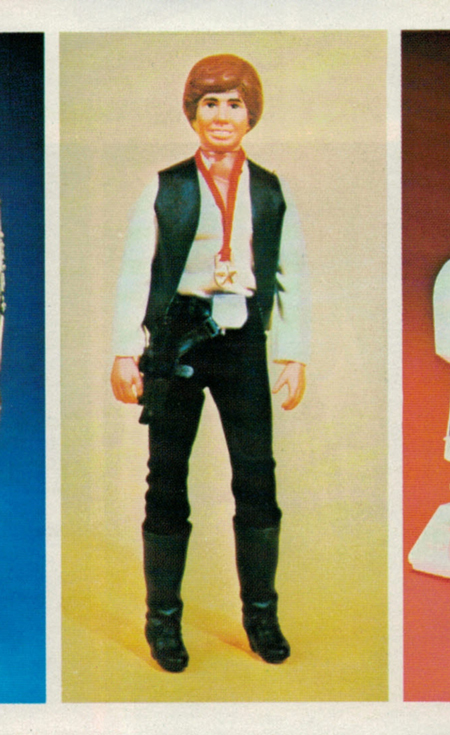 I recently got a Denys Fisher catalog from the UK, they seemed to only carry the 12" Star Wars line and I couldn't help but notice something was different about Han. Gaaah! It's Topher Grace! Run! I am pleased to reveal the latest update to our Tomland galleries, the copyright infringing superheroine herself, the Sonic Woman! 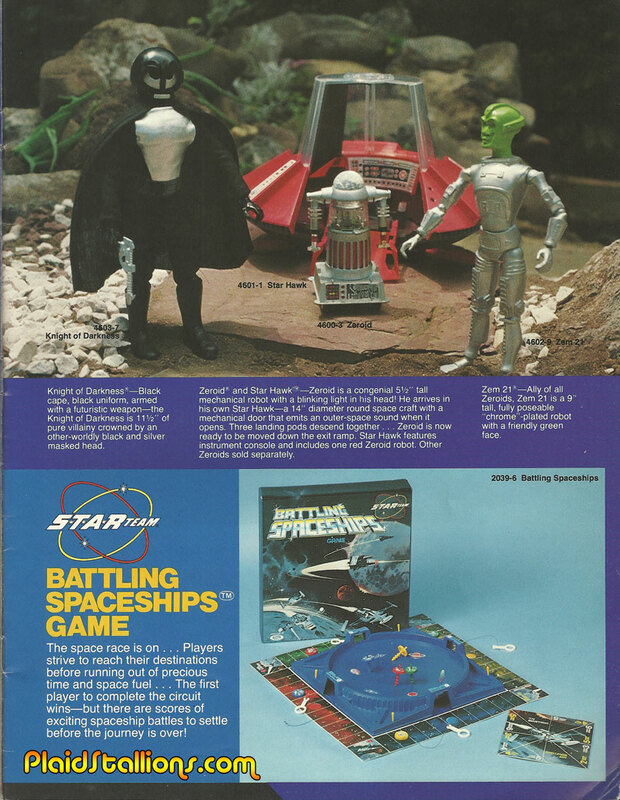 Tomland was more well known for their Star Raiders and Famous of Monsters of Legend action figures, which both demonstrate how little they thought of paying for licenses. I've known about these particular figures for a few years but never knew their actual names, below are a set of loose "Sonic People" featured here earlier. 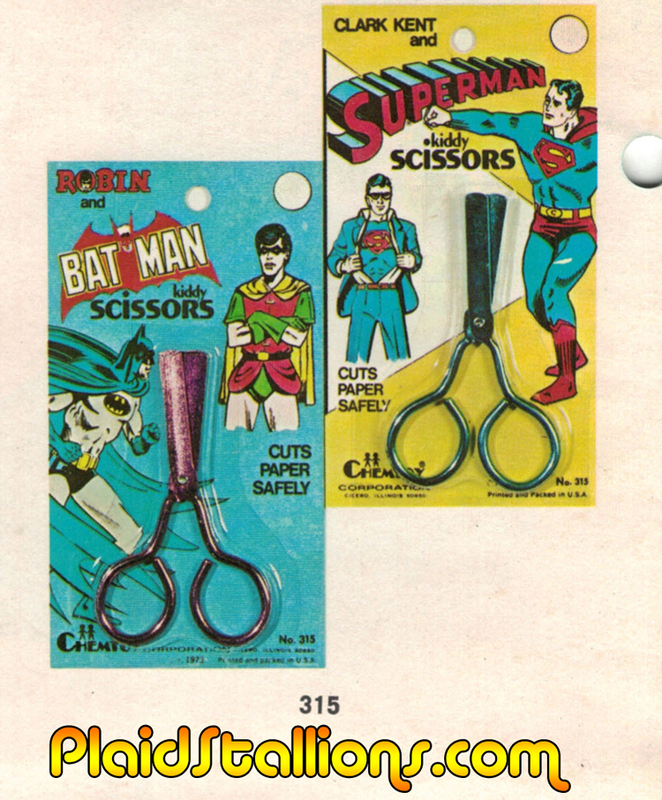 They were also shown in Rack Toys. It wasn't until a kind soul contacted me about this figure did I finally have a clue. 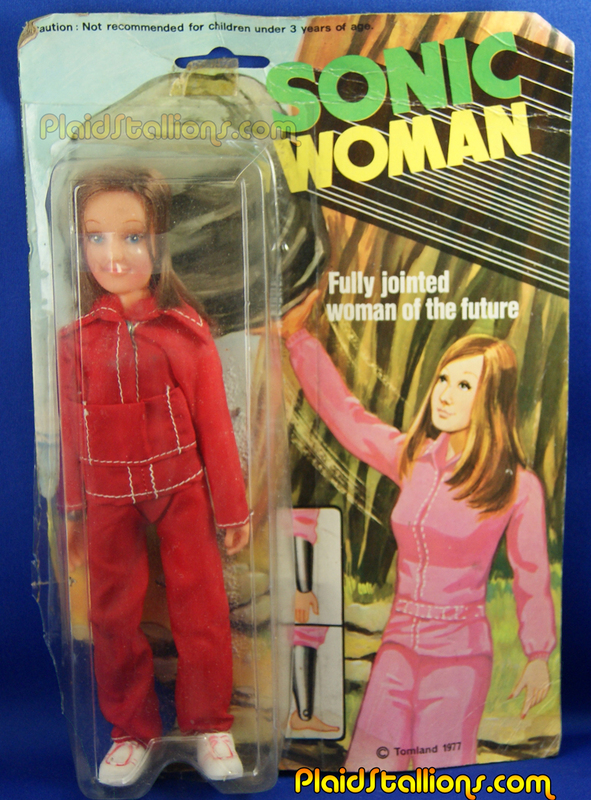 The arrival of the carded Sonic Woman clears the name mystery, thanks internet! 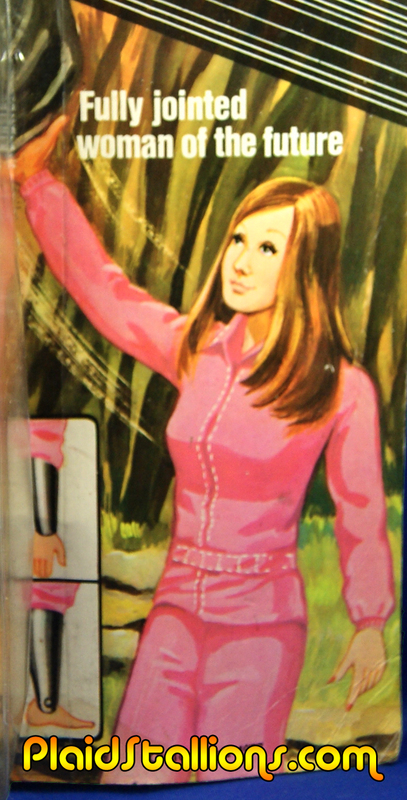 As obvious as this "fully jointed woman from the future" is she's not the most blatant Bionic knockoff by a mile, that will be revealed in a new list this Friday. Please check it out. Also, please check Ebay as I'm selling a loose Sonic Woman right now. This is the only loose one I've ever seen, so if you're into this like I am, this is your chance. I'm always buying Tomland Monsters, click here to email me. 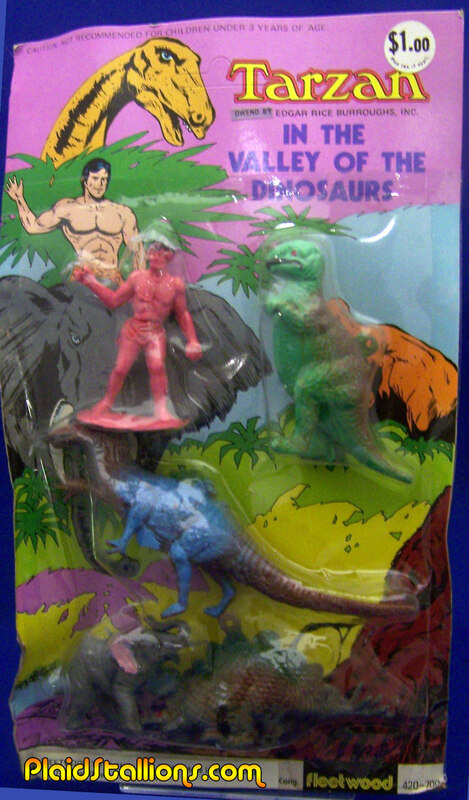 Another item in my mad obsession with Filmation's "Tarzan and the Super 7" merchandise, which 99% rack toy based. I've had this boy's watch for a while but this is my first girl's version. 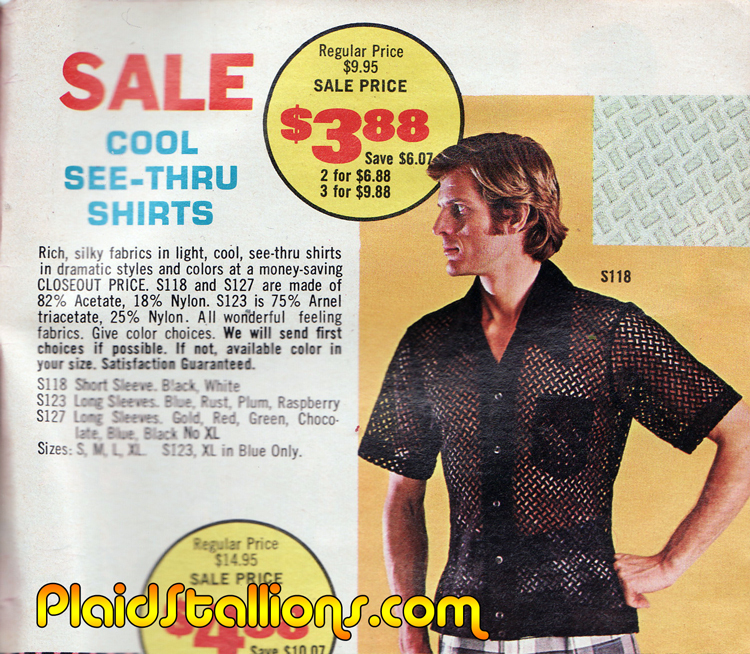 This picture from the catalog suggests I've got more to track down. Come on Super Stretch! 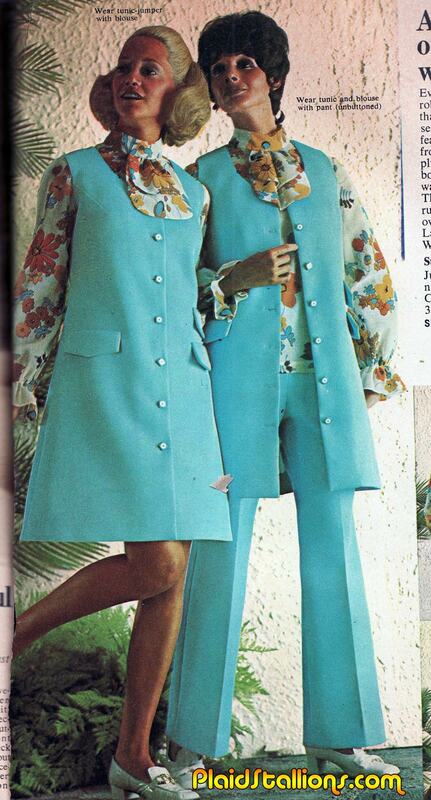 Oh my goodness, where to begin? 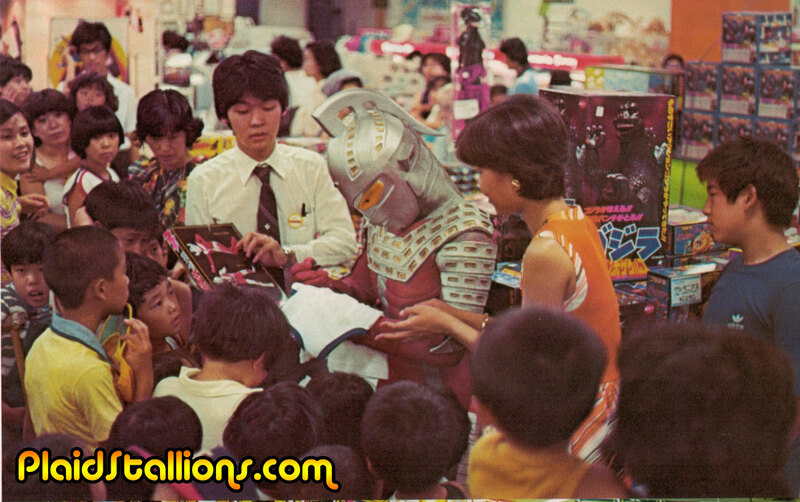 One, this is not only a mall appearance of one of my favourite characters but it's in a 70s toy store setting. 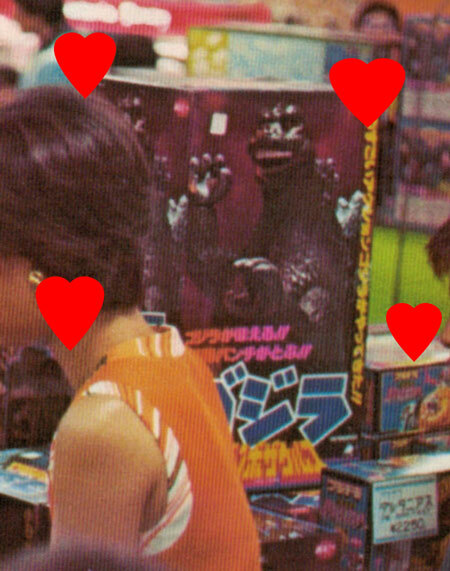 On top of that it's in a 70s JAPANESE toy store. Adding to this frenzy is one of my holy grails just sitting on a shelf, the Popy Godzilla. 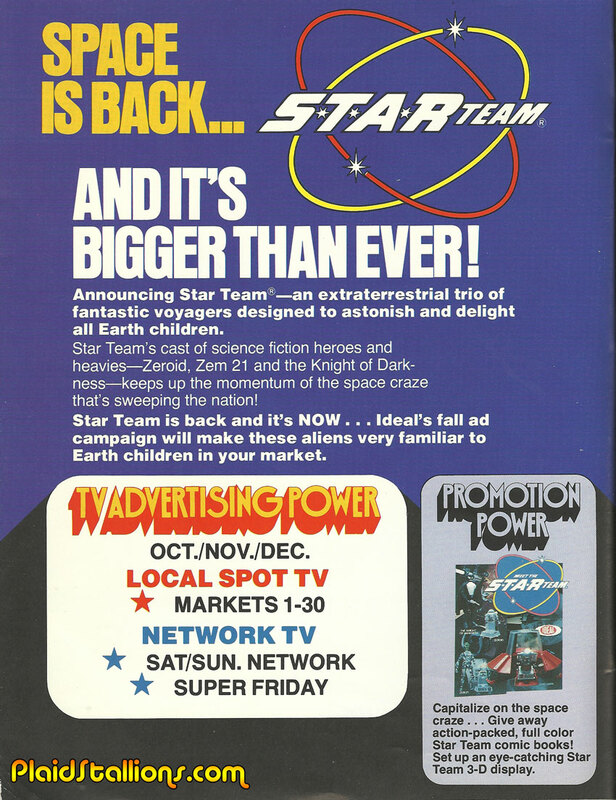 I found this great promotional piece for Ideal's Star Team relaunch in the 1970s, I really haven't written much about these in years so I think they deserve some fanfare. 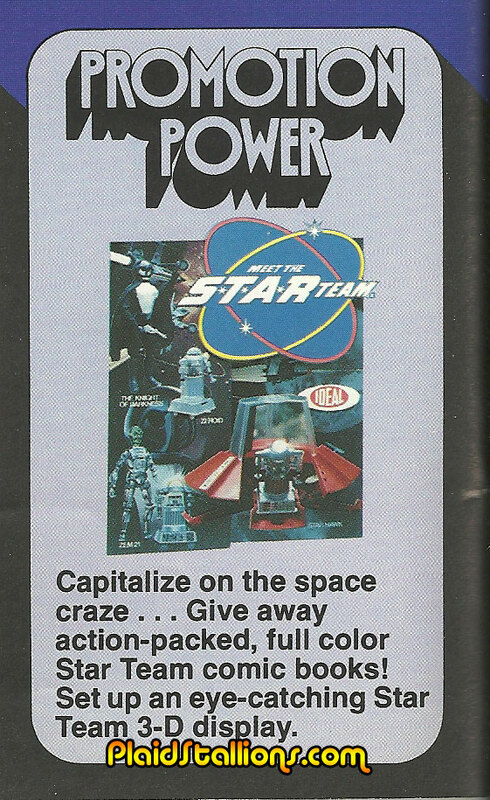 While Kenner was running around selling empty boxes and promises to kids for Christmas, Ideal resurrected an old brand used to market roll play space toys in the late 60s, dusted off some old molds and viola, they rushed some space toys to market. They even released their own promotional marvel comic as mentioned above, I've scanned the book if you'd like to see it here. The prototype Star Team cast. Of course, the famous story is Lucasfilm sued Ideal but lost because all of the Star Team stuff was made prior to Star Wars. The Zeroids was a toy line from the late 1960s, Knight of Darkness utilized a Captain Action body and other parts, it's a rich tapestry. I can't believe it's been over a year since I last raved about my mild obsession with Whitman comic poly bagged 3 packs of my youth. I guess that's because I haven't across many deals and actually let some awesome ones slip through my fingers. 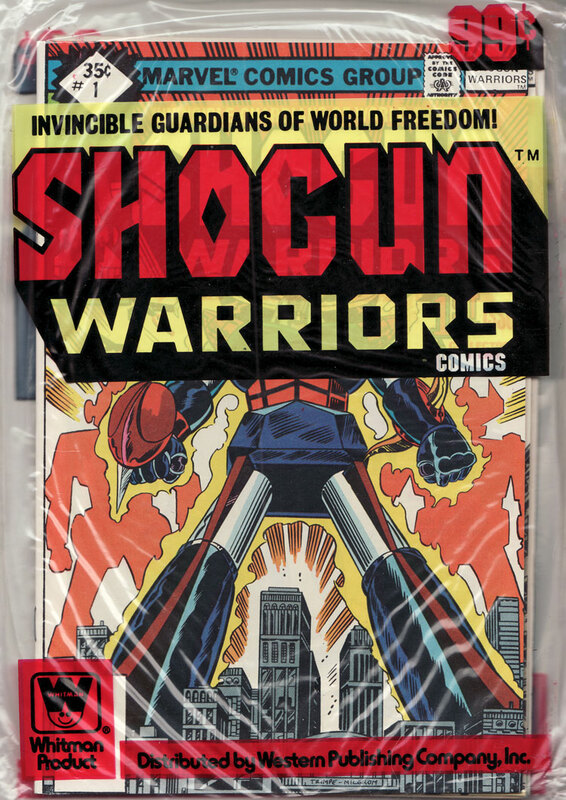 Above is Shogun Warriors, while I never had any of the toys, I was really into this comic as a kid. 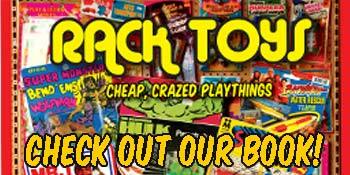 Between this book, Star Wars, Godzilla or Micronauts usually got my pocket money. That is, unless Hellcat or Batgirl was on the cover of something, then I felt oddly compelled to buy that book. 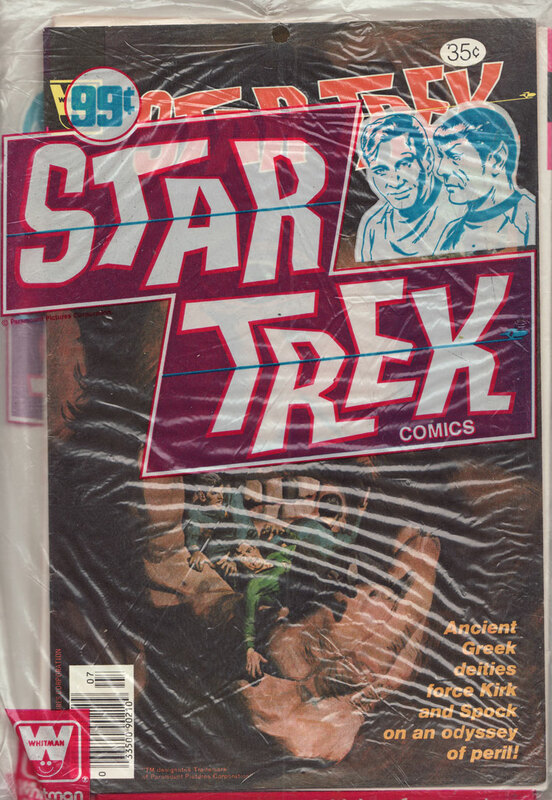 This three pack of Gold Key Star Trek reprints is another personal best for me, while it has been opened, that just means I can enjoy the off model adventures of the Enterprise crew. 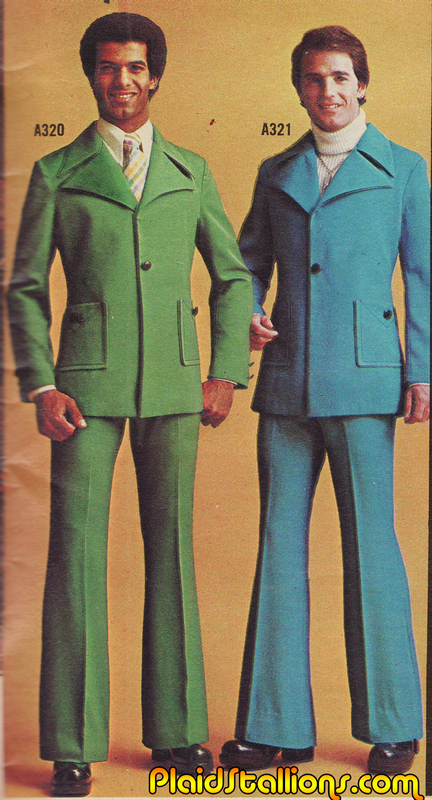 Either one of these gentlemen can easily explain why a quadraphonic sound system is right for you. Another one of those products where, once you detach them from the card, they have no real connection to the characters after. I do love the Batman card though, it looks like Robin is fed up with Batman's need to run with them. 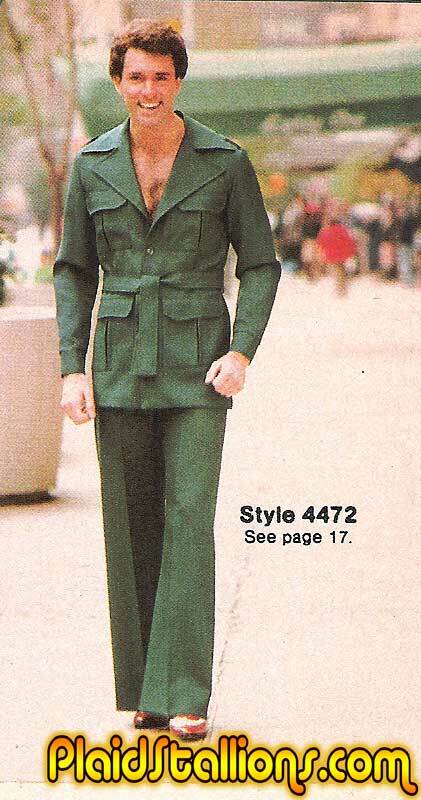 The brief fad of dad's wearing this monstrosity around the house has kept the therapy business alive since 1977. Carnival was the premier maker of toy musical instruments in the late 1970s. 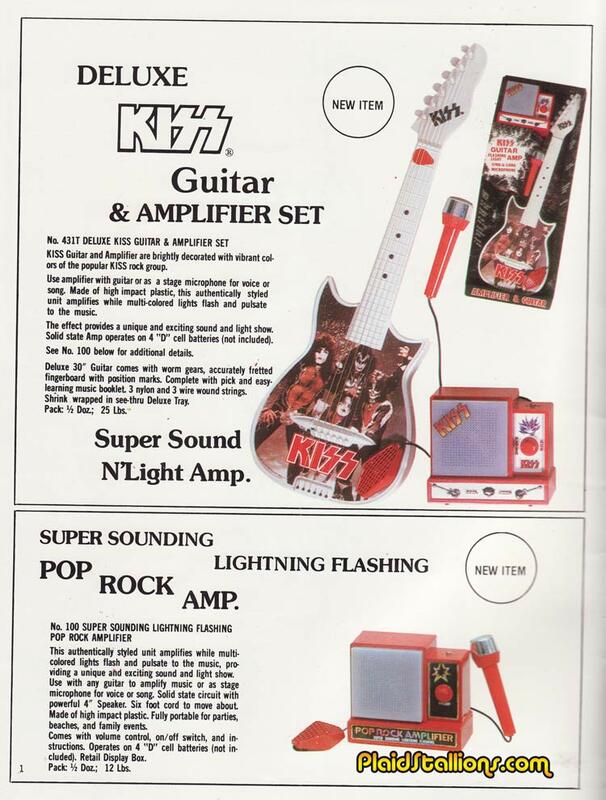 Their main focus was toy guitars and licensing, making sure they slapped the hottest acs of the time on their guitars (even when they primarily known for disco tunes). 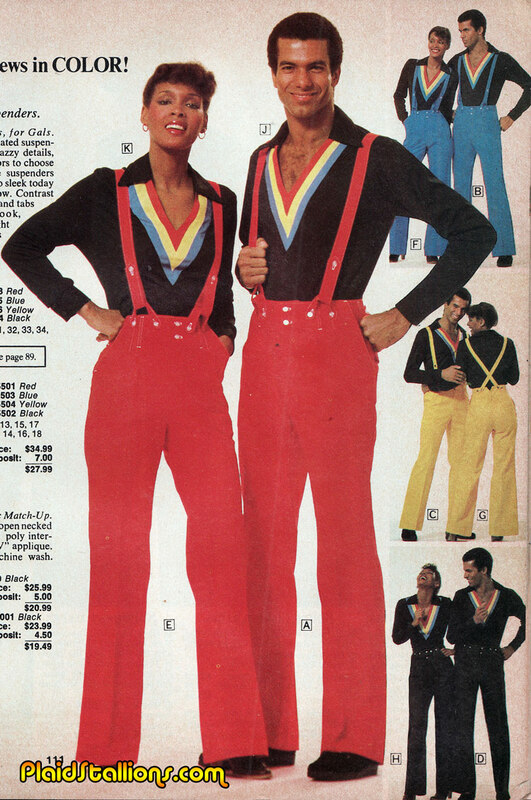 So join KISS, the Village People, Hulk and Spider-man (! ), the Bee Gees, Shaun Cassidy on a mystical, musical adventure. Spidey used to be cool before he sold out man. 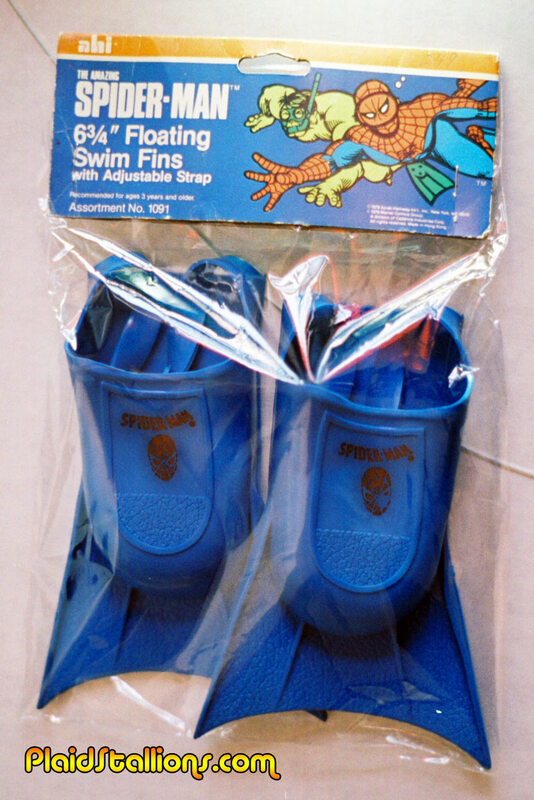 Rarely discussed here but Rack Toy manufacturer AHI had a second life as a manufacturer of pool related novelties, one of these days I'll pull up one of the catalogs.